Lham Tsering is from Tawang, a town situated at an elevation of approximately 3,048 meters in the northwestern part of Arunachal Pradesh in India. His father abandoned him long back because of his special condition and his mother can’t go out to earn their livelihood and even when she goes out for a part time work, she lock him inside the room. Child is having difficulties of speech, hearing and movement since birth. He is in need of full assist on his daily activities, such as feeding, dressing, toileting etc. Due to remoteness of his home and poor financial status of family, he is admitted in this special need for the improvement of his condition without charging a penny. Therefore, any help render for this differently abled child is highly appreciated. Sonam Dechen lives with her step father, mother, grandfather, grandmother, younger brother and younger sister. She caught paralyze when she took immunization vaccine at the age of four months. Her mother met a man came from Tibet and settled her life with him. Her mother has two children of present husband. Sonam’s step father is working as cook and mother as care taker of monastery cattle. The family living condition is very poor and they do not have any other sources of income or support. The child’s mother is facing difficulties in handling Sonam Dechen in regard time, energy and financially. Therefore, any generous help rendered for this child will be highly appreciated. Tenzin Norzom’s parents recently escaped from Tibet. There are four family members at her home. Her father and mother sell fast food at road side to run their home. Her younger brother is just one year old. They have to pay house rent to their landlord every month since they do not have their own house to live in. Due to poor financial status of the family, they did not have any other choice but to admit her in this special needs school. She is having major problems in her body movement as her legs are abnormally twisted inward. As such, she needs help on her most basic personal care such as using toilet. Any help rendered toward this child will be highly appreciated. Tenzin Dedhen lives with her family member of six. Her father left home to earn better income to support his family and his mother is a housewife. Her grandmother is 82 years old. She has one sibling twins and one younger sibling. The whole family solely depends on the income that their father earns. She has difficulty with her body movement and after on consulting with doctor, she was diagnosed as having developmental delay. She is having speech and learning difficulty. Her mother admitted her in this special needs school with a great hope that one day at least she can help herself without depending to anyone. Any help rendered toward this child will be highly appreciated. Sherab belongs to a very poor family. He is from a very remote place in Nepal called Tatopani. The main income earner of the family is his mother who sells homemade butter to meet daily needs of their family. Being a disabled child, it is impossible for his mother to look after him, while continuing to make ends meet. Due to their poor financial status, his mother requested him to be admitted him to Ngoenga School. 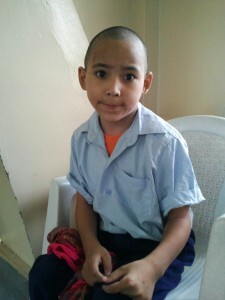 He has been admitted in this special needs school without charging any fee of medical, education and living expenses. Any support rendered toward this child will be highly appreciated. Sonam T Wangmo’s father work as a teacher in primary school and mother is a housewife. She is totally dependent on help of others for her daily activities because she is having great difficulty with her vision sight and body movement. She also has a slight problem of hearing and she is unable to speak at all. The cause of her disability is not known, but as per her mother, her problems began for the first time at age of 4 months. Her mother consulted doctors in Bhutan and they have confirmed that she is having problems with her brain activity. Currently, she is staying in Ngoenga school free of cost and is being taken care of by the school. Any help rendered toward this child will be highly appreciated. Tenzin Angdrup was born in Schilling, a remote village in Spiti Valley. A desert mountain valley located high in the Himalaya Mountains in the North Eastern part of Himachal Pradesh. He lived with his parents Palden Phunchog and Kesang, brother and grandfather. 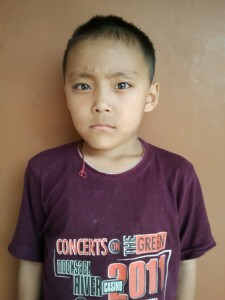 The family depends on farming which makes barely enough money to make ends meet and proper medication treatment for Tenzin is financially dependent on others for all of his personal needs. Therefore, we are requesting yours support for making his life a better. Yours help will be highly appreciated. Neema Lhadhun and her twin sister Sonam Ladhun lives with her mother and two maternal aunties. Their father abandons the family as soon as he came to know that the twin children are disabled. The doctor diagnosed them and named their condition as sjogren-larsson syndrome (SLS). The family depends on farming for their living & the mother is the sole bread earner of the family. The child can communicate with gestures and a few words in their local Monpa language. Any help render for this girl will be highly appreciated. Sonam Ladhun and her twin sister Neema Lhadhun lives with her mother and two maternal aunties. Their father abandons the family as soon as he came to know that the twin children are disabled. The doctor diagnosed them and named their condition as sjogren-larsson syndrome (SLS). The family depends on farming for their living & the mother is the sole bread earner of the family. The child can communicate with gestures and a few words in their local Monpa language. She is more active than her twin sister. Any help render for this girl will be highly appreciated. Tenzin Thinley belongs to a poor family. His parents are divorced and he lives with his mother. The child need full support on his daily activities. Therefore, any help render for this boy would be highly appreciated. Parents of this child are doing petty business to run the family. This child being the elder one had a delayed birth cry with convulsions of the whole body observed right after the delivery. High fever at the age of 3 months seemed to have taken his speech and movement. He is fully dependent on others and is presently on wheelchair. He is from a very poor family, who could not afford proper medication. Hence, he got admitted in this school. 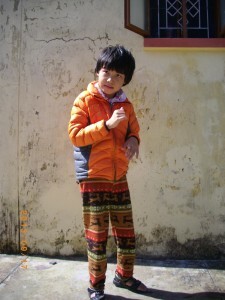 Tenzin Choedon is an orphan child with her admittance in Tibetan Children’s Village School at Dharamsala. She was admitted in this school as she is an autistic child with problem of sight, speech and learning. She is also hyperactive with spastic quadriplegia and global development delay. We are trying to provide her with the best reachable medication. She is also in need of good attention as being an orphan she seems to develop feeling of negligence. Although the expense of our school is depending on donation, we have 50 children who are in need of special care. Kunchok Lhamo lives with her mother and her sister. The father left her mother before her birth. The main income of family depends on petty business and her mother being only income earner in the family, she is facing lots of problems to look after her daughter. 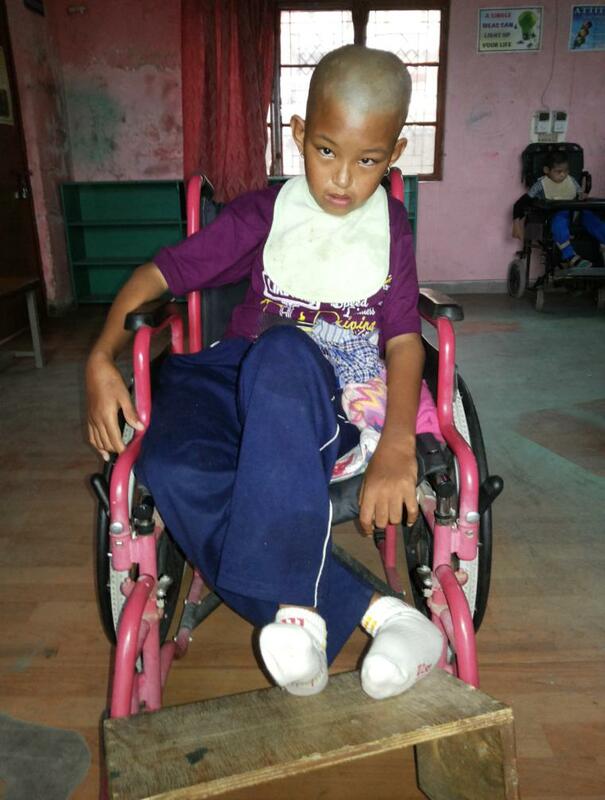 Kunchok is facing under condition of behavior problems, learning and speech impairement. Therefore any support rendered to the child will be highly appreciated. 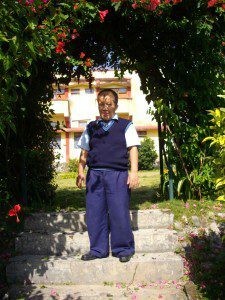 Tenzin Delek started walking at the age of two and started drinking at the age of three. His mother work in Mentse Khang, Dehrardun as an accountant. 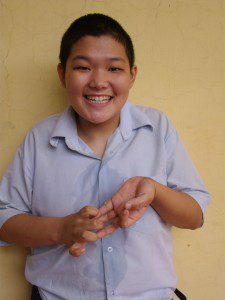 Tenzin Delek loves to play with smooth objects or toys and loves to listen music. Any help rendered for this boy would be highly appreciated. Tenzin Dorjee is a semi orphan and his mother as the main bread earner. He was born normal like other children. But at the age of 13 months he fell down from a second floor that cause his brain damage. At the age of 9 he was hit by motor cycle and his condition become worse and now he is facing lots of problems in his daily life. Any help rendered for this boy would be highly appreciated. Tsering Yangzom is one of the children of seven and among them two are attending school. The child has problem with her feet and had surgeries for four times. But there was no improvement. Therefore, the family of the child has decided to admit her in these special needs school with a hope that one day she can be much better and can live an independent life ahead. Attending main steam school at Dekyiling Sambhota School. Note: She passed VIII standard from Dekyiling Sambhota school in February 2017 and applied for CST School for further studies. 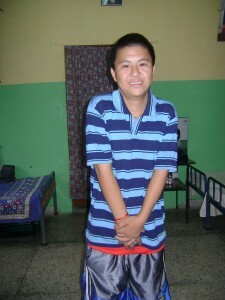 Tenzin Lhakpa has one younger brother and he is staying with his parent in Kathmandu, Nepal. His father is the only earning person in the family through tailoring and his mother is a house wife. Tenzin Lhakpa has problem of movements with great difficulty. He is on wheelchair and can speak in Tibetan & Nepali, but not fluently. Tenzin Seldon has 3 brothers & 2 sisters. She is the youngest child of the family who had fits at the very initial stage of 4 months as per verbal saying of her parents. Doctors told it as epileptic fits where controlling medicines were given. Child took epileptic treatment till 4 years after that no fits were noticed even without medications. Seldon started walking when at the age of 3 years as per her parents saying. Child is having a speech problem with mental retardation. She is totally dependent on adult for her daily activities. 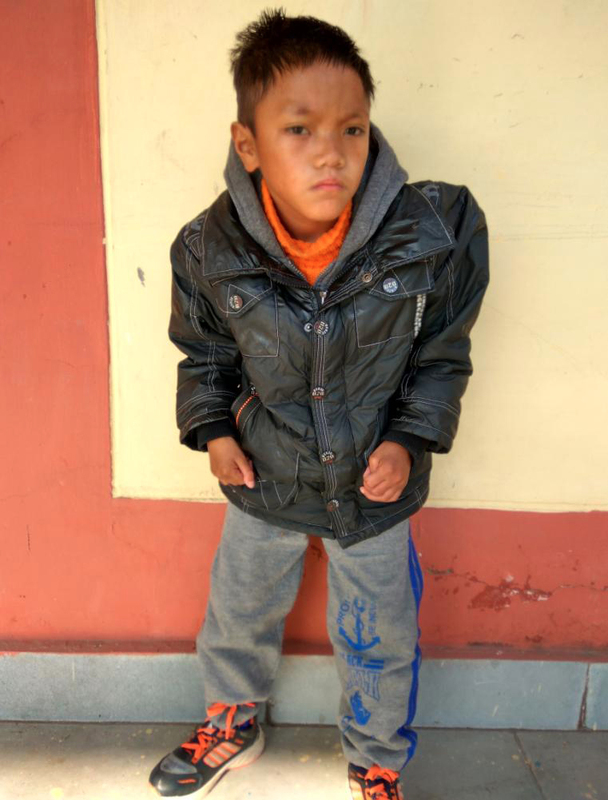 Tenzin Rabjam is more like an orphan since his parents are unable to take care. He got three siblings and they are looked after by their grandmother. 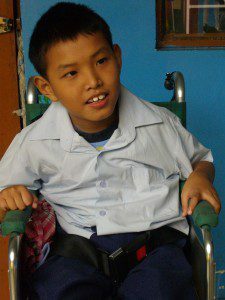 Rabjam is a wheel chair bond child who also can’t speak at all. He has two sisters with parents earning through farming. He is from one of the remote areas of Ladakh, north India. 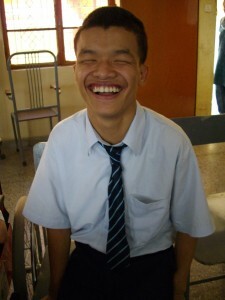 Unfortunately, he suffered from high fever resulting present autism with learning difficulties. The area from where the boy is remote and there is no dispensary also. Parents being illiterate failed to take first aid. This mishap made Pakto disable. We are trying to provide him with the best medication as he is not a severe disable case. Rinchen Sangpo is taking care of by his mother as they are divorced. The mother is taking care of three children. She works in the settlement handicraft centre to earn. 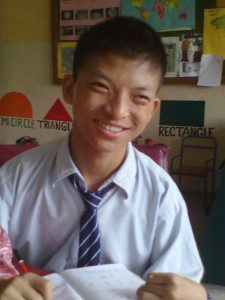 Rinchen’s medical undertaking was bored by the camp association before his admission to this school. When Rinchen’s mother was pregnant, she had a sideward falling mishap resulting into labor pain that lasted for a whole week. His birth cry was normal but his right side defects of the limbs were seen at the time of birth. He was also unconscious right after the birth for an hour succeeded by tremor shaking of the body turning into blue. New born Rinchen was hospitalized for 8 days under strict medication. He had a milestone delayed development walking at the age of 2 and half years. He was given Tibetan medicine also. But, little progress was noticed. 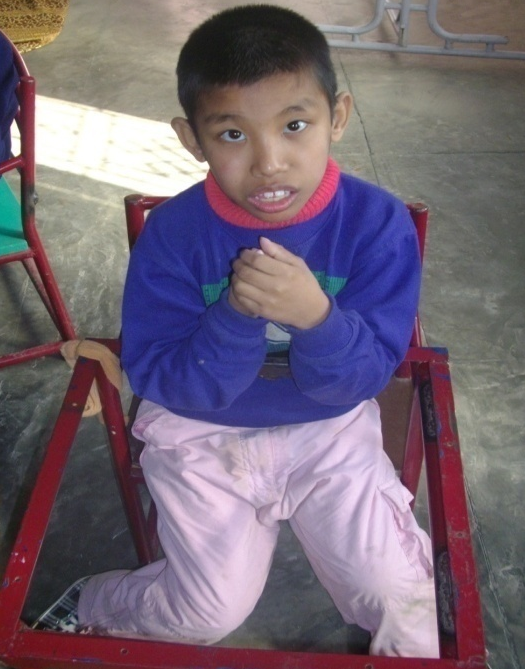 Rinchen is a case of mild physical difficulty associated with learning difficulties. He has squint eyes and a slight speech problem that is congenital. Besides, he had a creative mind with his skill of creative drawings. He can understand everything that is told to him but face difficulty responding back. Tashi Tsering belongs to a divorced parents with five children. Four children are school going and the eldest sister helps to earn for the family. Their mother is an aged lady who is unable to take care of her family. 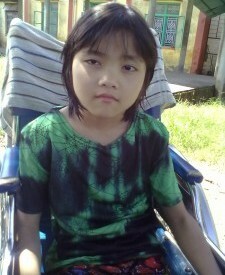 Tashi is a wheel chair bond child with cerebral palsy. 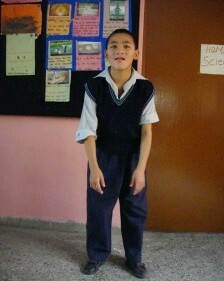 He is also speech impaired and he likes all children and communicates through Indian sign language. He also like music and his disability prevent him from dancing; he involves himself in the dancing group by his gestures. Penpa Dolma’s parents got divorced and father expired due to chronic tuberculosis few years back. Now the children are under the care of their relatives. 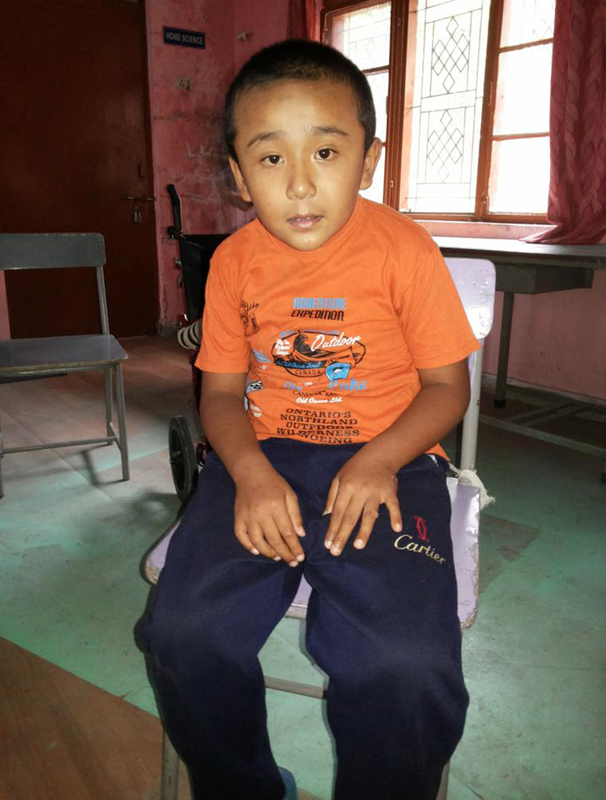 Due to the sympathetic condition of the family, one of the children got admitted in the Tibetan Children’s Village school. Her brother was also admitted in one of the Tibetan Children’s Village school after getting through VIII standard from Deckyiling Sambhota Day school in Dehradun. 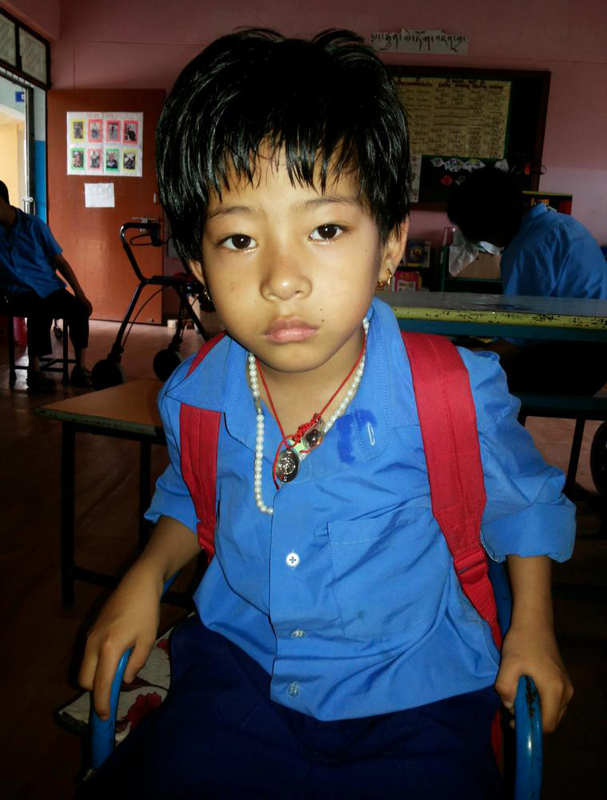 Penpa Dolma and her brother were admitted in Ngoenga special school together. Penpa is a case of Hemiplegic (left side) and speech impaired. She is also a patient of spastic cerebral palsy affecting all her four limbs (Quadriplegia). 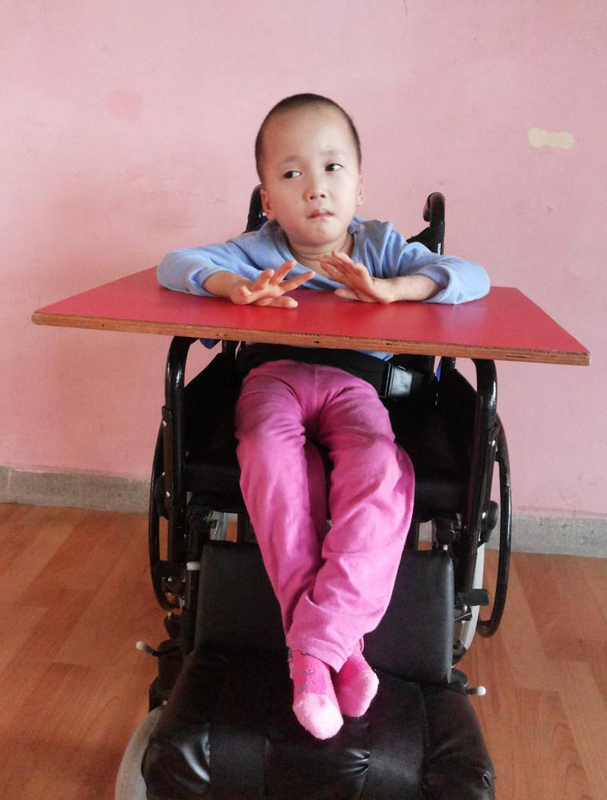 Despite her disability, she has an excellent understanding power, and keen to learn and to join in all activities. Her social skills are very good. If timely correct provisions are able to provide, she can lead a normal independent life. 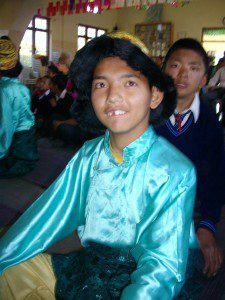 Tenzin Lhamo is a child born to a mentally retarded mother who could not shown the child’s father. Tenzin Lhamo has no siblings and she has been under the care of her uncle. Uncle’s family consists of 13 members with 6 children. All the dealings regarding this disable child is done by her uncle who is a farmer. 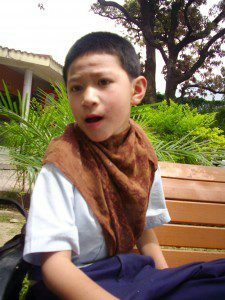 Tenzin Lhamo was born with autism and mental problem. She loves to be in contact with adults & with quite children but is very anxious when she is placed near children with behaviour problem. Her speech is observed as very clear but without any meanings and she got very limited understandings. Her uncle is helpless to consult her congenital abnormality to any doctor as he is financially not reachable. He had to fulfill the daily needed requirements of the family as a priority. She is from a family of 7 members with their father as the only earner who works in an airbase as laborer. Mother is housewife who takes care of the whole family. The family is settled in a remote area of ladakh northern India. 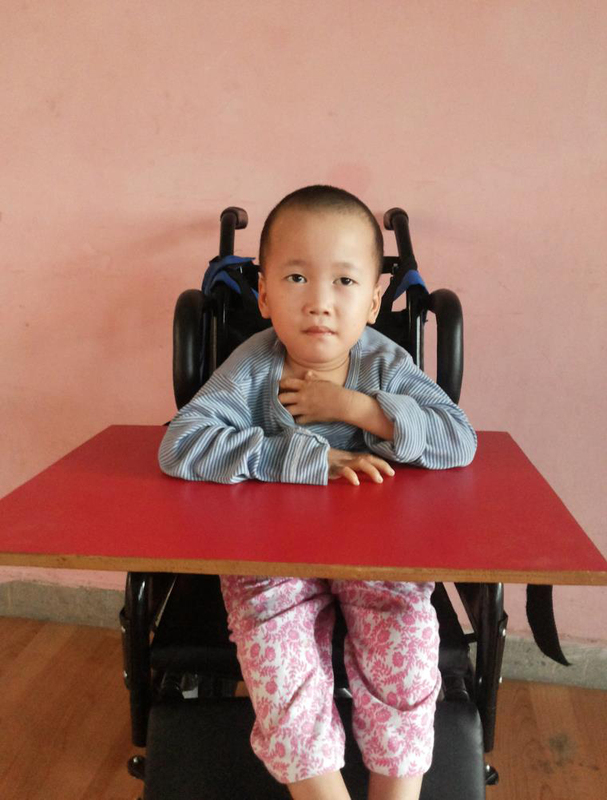 Lobsang Tsering is a mentally retarded girl and she is one of the senior students of this institute. Tsering Tenzin is a polio victim child. He can’t walk or sit properly and is on a wheel chair. He belongs to the remote areas of Ladakh where people failed to get modern provisions. His parents are leading a nomadic life. He is a case of severe quadriplegic cerebral palsy and had knee contractures by birth. Poor child is also having epilepsy. However, medication succeeded to control major part of his frequent fits. Pema Lhakyi is a semi orphan girl with mother as the only earner for the family, who works as a carpet weaver in the settlement handicraft center. Pema also has a grandpa who is 70 years old & unfortunately, had his both eyes operated & is helpless to do any sort of work. Pema is a victim of severe autism together with profound learning difficulties. There is no meaningful speech and one can find it very hard to understand her language and relate the same to others. She had a history of seizures at the age of 1 & half years old. She can’t speak or follow others although she seems to enjoy others. She loves to be in the company & hates to remain secluded. She is a lover of music. Tenzin Khedup’s family consists of 9 family members with 7 children. 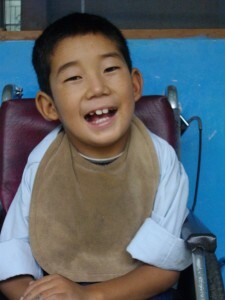 Tenzin is the only wheel chair bond child suffering from cerebral palsy with scissor gait by birth. His father sustains the family by working in the field and mother being ill health. Moreover, all the children are young and attending schools. The financial condition of his family is sympathetic. Tenzin Khedup is mentally very active with lots of things to talk to anybody that comes across him. She is a semi-orphan girl with mother as the only earner of the family with an aged grandpa to look after who needs extra care and attention. 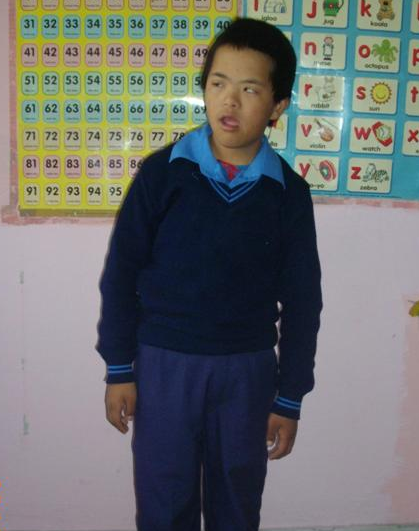 Tsering is a victim of Down Syndrome with severe learning difficulties. She loves to be in the company of adults with changing behaviour dealing with other children that always creates problem. She seems intelligent within her abnormality as she puts up lot of questions relevant to the situation & listens attentively to what others are saying, yet she fails to absorb. She is a fat girl as you can imagine who drools when she smiles and talks. Wangchen’s parents are in an underdeveloped area of Nepal where main source of income is farming. His parents are aged with many unemployed children to look after. Although the parents earn, yet proper medication for this child is out of their financial reach. Tenzin Kelsang belongs to a poor family with agricultural background. Parents are doing cultivation on 2 acres of land which is the main source of their income. 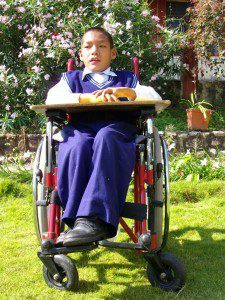 Tenzin is the only disabled child and his other siblings are attending the main stream school. Parents being illiterate failed to consult this child to the doctors in time. 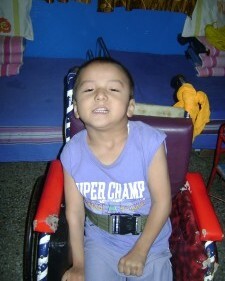 Tenzin is also a victim of Cerebral Palsy that is usually caused by brain damage before or after birth. Tenzin Jampa belongs to a family of 7 members that includes 3 girls & 2 boys. His father is a retired serviceman and due to certain conditions he is not getting pension. After birth, Jampa is recorded as having water in the spinal cord that was sucked after few days. At the very age of 3 months, Jampa became victim of meningitis that was succeeded by epilepsy. At present, he is taking both the tuberculosis and epileptic medicines. He is also a case of cerebral palsy and a hemiplegics with speech impaired having physical disabilities. Choekphen belongs to a family member of 14 with 3 siblings. Mother is the only earner who does petty seasonal sweater business. Chokphen’s mother had a difficult home delivery & Chokphen was noticed as congenital dumb. Mother consulted Chokphen to doctor when she was 2 years of old where she was suggested for a tongue surgery. The surgery was withdrawn due to financial constrain and religious ethics. At present, Chokphen had an abnormal development, tremor and is speech impaired. She also had a profound learning difficulty and has some difficult behavior due to her great problem in understanding. Although dump, her gestures makes other understand fully for what she wants to convey. She has difficulty in sharing. Rinzin was born as twin child to Lhakpa Sonam (late) and Tsering Lhamo. His twin sister is normal and presently in 5th standard. The family has 2 more children. As the only earner, mother sells Tibetan traditional biscuit “Khabse” in addition to her daily earning as labor to earn little more. 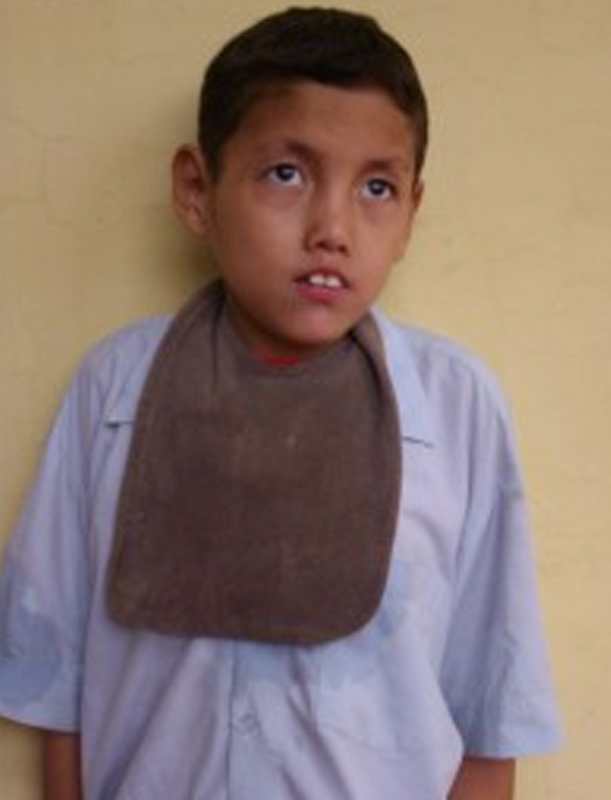 Rinzin is a physically & mentally challenged boy with behavior problem. He is also hyperactive with emotional problems. He was born blue and also attacked by Measles at the very age of 2 & half years old succeeded by tuberculosis when he was 3 years old, where he had to undergo tuberculosis course for six months. Rinzin is extremely quite with adults & with his schoolmates. He is a disable boy who prefers to use his gestures rather than words to express what he feels or wants to express. His activity mostly depends on his moods. Tamdin is from a poor family and to cover medical expenses while he was at home, his mother does seasonal business and father stays home to look after. Still, they are unable to provide this child the proper treatment due to financial obstructions. Tamdin is admitted in our school on 8th March, 2000 as he is a victim of Epilepsy with cellulites of eyelids and foreheads that was well controlled now. 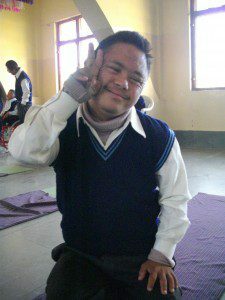 Down syndrome is the other problem of Tamdin where he got learning difficulties due to his mental ability that is below average. He is also having weakness in his left hand. 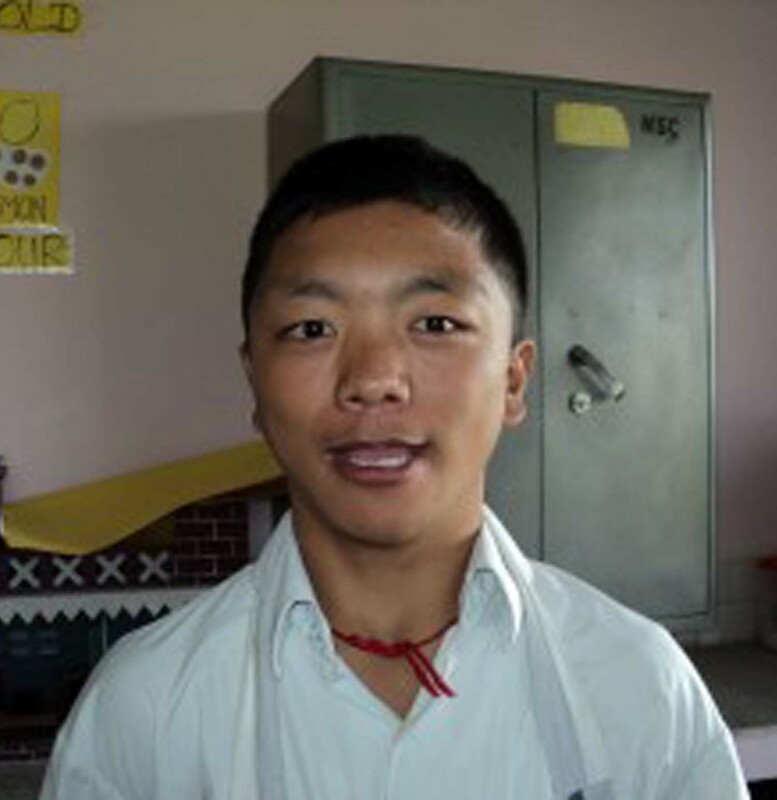 Dorjee Namgyal is a semi orphan with his mother as the main bread earner of the family. 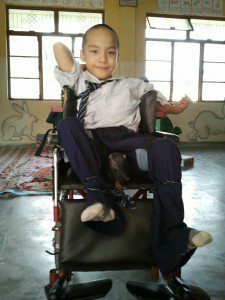 Dorjee is suffering from Cerebral Palsy with left hemiplegic that can be described as a medical condition usually caused by brain damage before or at birth resulting into loss of control of movement of the limbs. 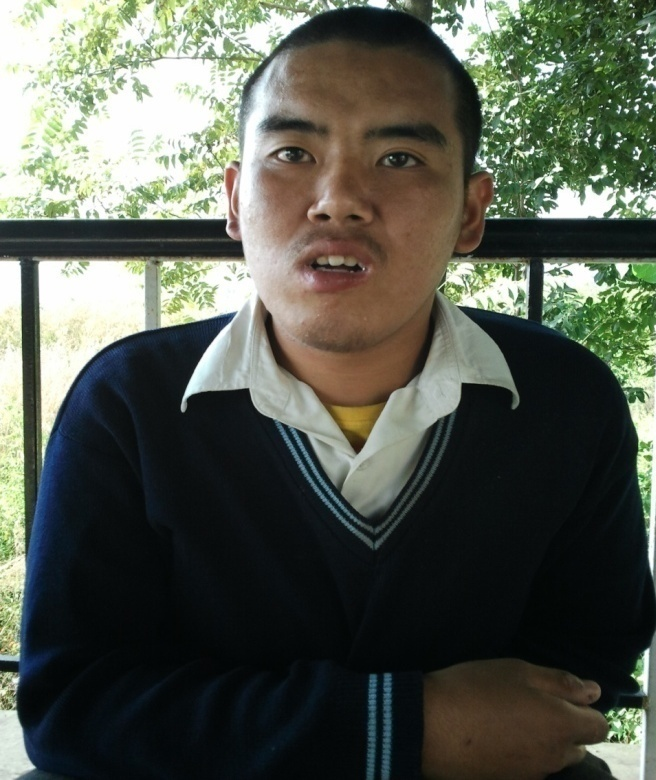 Dorjee also got speech problem & has severe learning difficulties. However, his epilepsy is well controlled by medication. He is regularly made to attend physiotherapy class where our physiotherapy unit is trying for effective output. His father is working in this school as a care taker and mother in the handicraft center of Tibetan Women’s Association at Rajpur. He got two siblings attending the main stream school. He has learning difficulties with behaviour problem. Most of the time, he loves to use his whole body & facial expressions to communicate. He can fingerspell the alphabets & can also use the same in identifying names. He was born mute with only few words to speak. 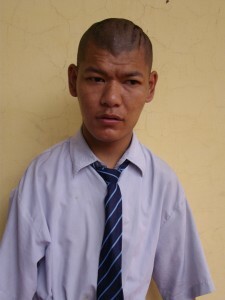 Tenzin Choephel has one elder brother and one elder sister; both of them are attending school. His father is working as a cook in sos TCV school in Ladhak, and his mother working as a manual labour. The child is under the condition of spastic cerebral palsy with right sided hemiparasis and contractive deformity and mental retardation. The child is always cheerful by nature and his general understanding is quite good. The child has the potential to develop both mentally and physically. Tenzin Choezom has one younger brother and they both live with their grandmother. The child is left under the care of her grandmother as mother lives in Delhi for earning and to support the family. Tenzin Choezom can response with a few words, but most of the times she just murmurs a lot. 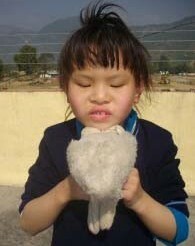 She is under the condition of mental retardation, Speech problems and hyperactivity. Tenzin Choyang’s parents got divorced and he is staying with his mother and grand mother. His mother is the only earning person in the family and running a small shop. His mother also has to look after her own aged mother. 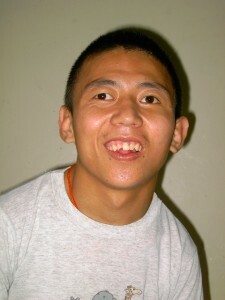 Tenzin Choyang has problems of hearing with great difficulty and he can not speak at all. He got admitted with great hope to get proper education for his bright future. Presently, he is attending a hearing impaired school. Attending Bajaj institute of Learning for hearing impairment school. She belongs to a farmer family with one younger brother & a sister. She is a case of spastic diplegic. As per her record, she used to suffer from frequent fever with high grade fever right after two days of delivery. She was told as having problem with the deficient supply of oxygen to brain. Tsering Dolkar was also having epileptic fits where parents have consulted to different local doctors and she is under medication. With problems in her movement and speech, our school is trying to improve her present condition. This boy belongs to a family of four members with one brother. Mother is housewife with father working as truck driver. Tsering Dorjee is a congenital deaf & dump. Parents tried to consult this child to different doctors although they are financially under stress. Otherwise, he is very intelligent with good grasping power. He is very good at drawing. He is attending a school for hearing impairment nearby our school and our vehicle drops him in the morning and picks him up in the evening. He is getting education through Indian sign language in that school. Nyima Lhamo’s parents run a small tea stall to sustain the family in Ladakh. Her mother met with an accident when five months pregnant that results into 8 months premature birth of child Nyima as twins. Nyima was infected with some unknown disease right after two days of birth where direct injections were given on child’s buttock. Child got a very weak speech when minor but became completely dumb afterwards. She is also having problem in the movement of her left hand. Father strive the family by income received from the tea stall since mother fails to work anymore after the accident. Tenzin Sherab belongs to a neutral family with two sisters. The demise of her father makes Tenzin’s mother unable to look after her three children single handedly. Child is a case of cerebral palsy & spastic diplegia. Both her legs are paralyzed. 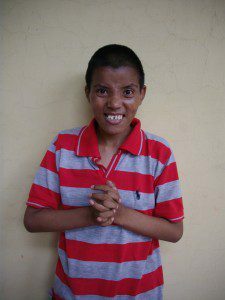 Within her disability, she is intelligent & is observed as being able to recognize alphabets of both Tibetan & English. Above that, she can also do so many puzzles. At present, her mother is working as a peon in a department of Central Tibetan Administration in Dharamsala and her income is not sufficient to look after her three daughters. Tenzin got admitted with the great hope for improvement. 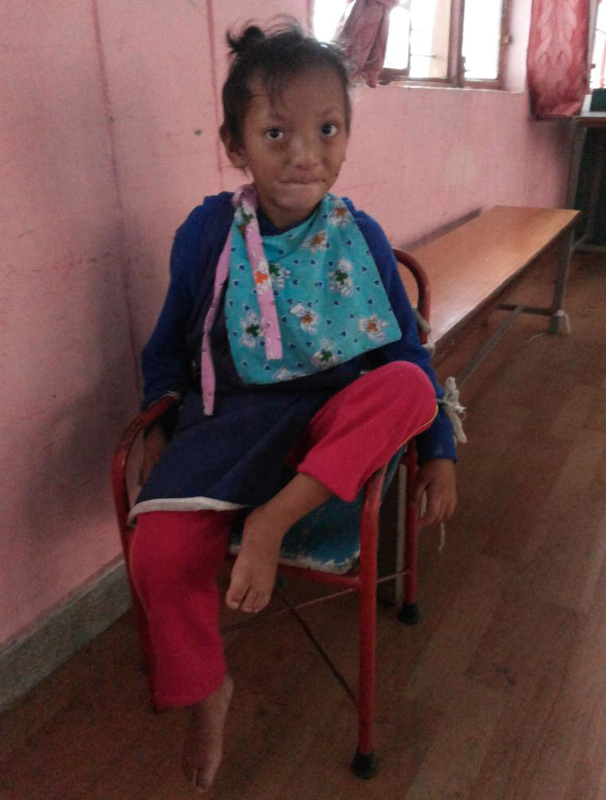 Our school is trying our best to provide her with the timely facilities so that she can be able to walk. At the same time we are finding sponsors for this girl and you are requested to sponsor this little girl to make a difference in her life. Tenzin Sangpo is a semi orphan child who belongs to a family of nine members where mother is the only earner. She works in the field to sustain the big family of 9 members consisting of 5 children and a very aged grandpa to take care of. Sangpo was born normal at home and unfortunately after 3 months of his delivery, he had to be admitted in Intensive care unit for 2 days & was later put under glucose. At 4 months, Sangpo was observed as having seizures because of which he was consulted & admitted in Delhi hospital although his mother hardly fulfills the daily requirements of her family. However, the consequence of these mishaps lead to weakness in his left side of the body & got slight difficulty in talking. He is a case of hemiplegic (Left) & is also having epileptic fits and had severe learning difficulties. Thinley Norbu has 4 elder brothers & 2 elder sisters. His father works in Tibetan Co-operative society as a salesman and mother as housewife. A high fever at very early age caused him mental retardation. Parents sent him to school but he learns nothing. After concerning a doctor, it was confirmed that the child is under the condition of mental retardation. Therefore, any support rendered to this child will be highly appreciated. Child is milestone delay by birth. He has lost his speech by birth and has start walking and standing on his feet at the age of 7. He has one younger sister and his mother is housewife. His father is the only earning member in the family and has destitute family condition. Tenzin Methok has one sister and grandmother. Her father works in factory and mother as a housewife. Her milestone development occurred during delayed by birth. Child doesn’t make first cry during birth, doctor said she has a very weak eyes nerve. She has joined problems by birth. Rinzin Dorjee is from Tibet and do not have any family members or relatives in India. This little boy faces movement and speech problems with great difficulty since from birth. He was sent from the Office of Tibetan Reception Centres, Mcleod Ganj, Dharamsala to Ngoenga School. Sonam Motup is an orphan, physically disabled. His parents have disowned him and left under the care of his aging grandfather. The father contributes a meager amount of Rs. 1000 per month when he was with his grandfather, but it’s insufficient. There are five family members including Tenzin Thokmey. He has a brother who is in a boarding school and a grandmother whose health is very weak with poor vision. His parents indulged in petty business for their living. Tenzin Thokmey is having great problems with his hands and legs. He is having problems with learning and speech. He is totally dependent on others for his day to day activities. His condition demands great care for him. Diagnosis: Cerebral Palsy (Quadriplegic), Profound disability. Jigme Choedon is from a poor farming family in Tibet. Her parents got divorced and she is with her mother. Her mother suffers from epilepsy. Both mother and daughter depend completely on farming even though her mother is physically weak.